710 Study San Rafael Neighborhood Posts: Déjà vu! Is Transit for You? GETTING THERE FROM HERE--I couldn't help but get a massive case of deja vu when I read the Times-reported decrease in transit ridership, and an excellent response by transit advocate Ethan Elkind. ... I think it's important to appreciate both points of view yet scrutinize them carefully. Ignore them at your peril, but don't take either approach as "gospel". I think that the Times writers are doing their jobs, and very much enjoy reading the work of both Ms. Laura Nelson and Mr. Dan Weikel, but feel obliged to mention that I've seen an anti-transit bias from Dan Weikel of the Times for as long as I've read him. Yet while I also respect and appreciate Mr. Elkind's work and opinions, I think that he, too, has his own bias that should be understood, noted, and appreciated. And, of course, I have my own bias--yet I have striven mightily over the years to be a "transportation" advocate and not merely a "transit" advocate. Which means that I am as bullish about smoothing out the 101 freeway for smoother flow, and widening the I-5 freeway to enhance mobility, as I am creating an Expo Line, a Downtown Connector, a LAX/Metro Rail connection, etc. I am also into innovative Uber/Lyft and telecommuting as I am major works projects such as the aforementioned freeway and rail projects. Ditto for DASH and bus operations funding while wanting to create more parking, bicycle and other access to transit. But it's not about me ... it's about YOU. Is transit for YOU? There are those who think that mass transit is something to be worshiped, with the car being the transportation anti-Christ. There are those who think that mass transit is a form of wicked socialism that prevents us from being free. And then there are the rest of us who just want a choice and a cheap, easy way to get from here to there, and who really wonder about the above two groups.We want affordable mobility that's not too tough on the environment, and which allows us to live our lives and make a few bucks to get by. Transit being "free" is like health care or college being "free"...unless there are volunteers involved, somebody is paying for it. Which isn't a concept too tough for most adults to grasp, unless some of us want it for free and demand that others pay for things for which we benefit. That demand doesn't sit well with most Americans, although economic stresses are probably making enough of us frustrated enough to insist on a break. 1) If the price of gas goes down, then we lose transit riders--and the Times writers have their case proven in that people DON'T really want to ride transit. 2) No one likes to be "forced" to do ANYTHING. So for any transit advocate or planner or transportation expert who bemoans the recent falling of gas prices, perhaps a good self-administered slap in the face (and I mean so hard that it stings for five minutes afterwards) is in order. Cheap gas means cheaper food, cheaper industrial costs, cheaper transit operations, cheaper airline costs, and a host of secondary benefits. Wanting gas and food and other economic costs to go up is misanthropic--and if you hate people, then fine...but don't be surprised if they'll hate you right back. Or at least ignore you. I think that both Nelson and Weikel on one hand, and Elkind on the other hand, do us all a good service. We need to confront why many of us either don't want to, or cannot use transit if there are other ways to achieve mobility. Lousy service, fears of our physical safety, convenience, etc. are all valid reasons and must NOT be ignored. Yet until we have a completed Expo Line, and a Foothill Gold Line, we won't have Metro Rail (with all of the linking bus lines) reaching the western and eastern ends of the county. And to be honest, until we get a Downtown Light Rail Connector and a LAX/Metro Rail connection, we will have a disjointed rail system as inconvenient our freeway system would be without the I-10 or I-110. So some hard lessons learned, and the ability to really LISTEN to both sides, are good for us all. 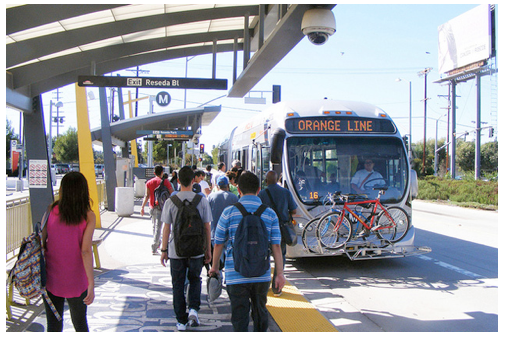 Problems with transit DO exist, and yet our Metro Rail system DOES have a brilliant future. But everything from parking to buses to bicycle amenities will be needed for transit to work. The Expo and Eastside/Foothill Gold Lines are alternatives to the freeways in which they parallel, so WHY is there insufficient parking for those driving long distances to get out of their cars to access the trains? Why are we using rail projects an an excuse for overdeveloping? Why are we using freeway expansions for overdeveloping? And why are we overdeveloping at all, if it will undo the mobility established by any new transportation project. That phenomenon is as smart as spending 25% more after a 10% raise. So maybe transit is for you. And maybe transit isn't for you. And maybe transit is for you when it comes to some needs, but not for others. But let's keep theology out of this. Neither cars, buses, nor trains have the numbers "666" engraved under them, and those who advocate for either of those forms of transit should use common sense and common decency in making their case. And I'll let YOU figure out whether you like my idea or not: I am a "transportation" advocate, a "mobility" advocate, and an "economic opportunity" advocate. I like ANY form of transportation that is smart, cost-effective, attractive, and something that enhances our Economy, Environment, and Quality of Life.